It was 1974. I watched number 715? 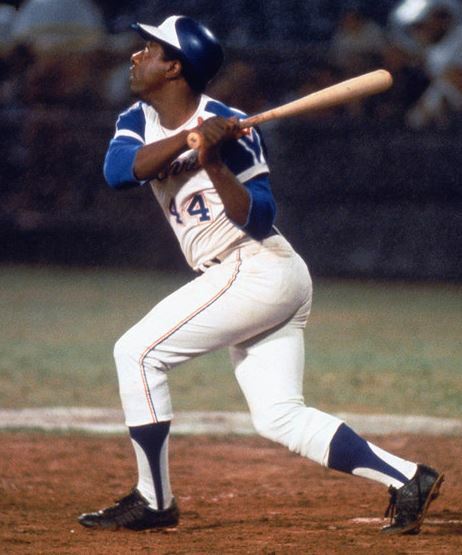 I can remember watching Hank Aaron break Babe Ruth’s record. I was in a basement in Illinois. I was watching it with my father and grandfather and some of the locals. Al Downing released the ball and Hammerin’ Hank drove it into the Atlanta sky. As Tom House caught the ball I remember the thrill that rushed through me. Wow… history! And then there was a voice. Someone in the room blurted out a racist comment. I clearly remember feeling a sense of disappointment at the comment and why… why did that guy stain the moment? I froze. Why did no one speak up? Why did we all act like it never happened and look the other way? I was fifteen years old. Yes, I saw number 715. And from that day on I wore number 44. Partly to honor the accomplishment the greatest home run hitter of all time. And partly in protest of the dirty comment that still rings in my head. I wore 44 as a way of making amends for my father and grandfather and for all those who heard the racist comment and said nothing and looked the other way. Coming from a family of baseball lovers, I guess it is only natural that I feel a strong sense of honor surrounds the game of baseball. And in my youth an obsession with statistics and history became a big part of honoring the game. Time passed and I grew older and slightly wiser but numbers still reflected history and they mattered. The ball wasn’t juiced. The players were! Today I am sufficiently convinced, like many other baseball fans, that there were players who decided to secretly take advantage of an illegal drug to enhance their performance. Now I could go into all the reasons this is wrong but that discussion has been had and at the end of the day either you agree or you don’t. As time passed I watched ESPN and other baseball broadcasts in hopes of hearing that the statistics of the steroid era must be taken with a grain of salt. I waited to hear that there is integrity in obeying rules and that those who cheat will, in the end, not prevail. I waited for the truth. But to my surprise I heard mostly silence. Nothing. Crickets. There they were, the same baseball announcers and ex-ballplayers who were so verbose about juiced baseballs and shrinking ballparks. Those same talking heads that went on and on about… where does the mud that baseballs are rubbed down with came from? Where were the balls made? Corked bats! And now those television talking heads were silent. Like the people in that basement back in Illinois. I waited for them to talk about the stain that had been placed on the game. I waited for a voice in the wilderness to stand up and say…”this is wrong”. And what I heard was silence. Even today ESPN and FOX baseball voices only apologetically cover the issue of the steroid era. And the Clemens issue has only made them more defensive. Off in the wilderness, on HBO, one brave soul spoke up. Bob Costas took on the challenge with aplomb. But overall dissenting voices were muted. Just watch highlights of Barry Bonds and the Giants play on the road. There is no serious coverage of how baseball fans really feel. There is no voice from the stands. And if Clemens comes back will we get to hear the voices in the stands, or will they be muted as well. Muted. Like in that basement back in Illinois. I am blessed with a wife who loves baseball as much as I do and we enjoy the game on every level. And even though she is a Dodger fan I still love her. She knows I am a Cub fan and she loves me too. She understands that to be a Cub fan one must have an even deeper love… a love for baseball. A century of losing puts winning in perspective and one comes to terms with the simple fact that, in the end, it is the game that we love. And with that love for baseball comes a love of history and statistics. So when I began to consider the effect the steroid era had on statistics I began to feel despair. The integrity of the game I loved had been smudged at least. The statistics were thrown askew and most of all, those that covered the game on TV were essentially apologizing for what had become this “unfortunate set of circumstances.” They were effectively “looking the other way”. Now the story of the foam steoid asterisk is an adventure in itself. Even though the LA Times, Newsday and several radio stations have given us a blip on the baseball radar screen we have only sold a few thousand foam Steroid/Asterisks. Did you know that one thousand asterisks were waved in Shea Stadium in May 2006? Oh you never heard that? That’s odd isn’t it? Well remember what I said… there are those that choose to look the other way. And sometimes those that look the other way are the ones who hold power and influence. I hit the phones and called the top three foam finger manufacturers. As it turns out I could only find three manufacturers that can make foam Steroid/Asterisks that cheap enough to sell. That is unless you go to China, but I was not about to have our baseball Foam Steroid/Asterisks made in China. So I called the USA boys. to step on anyone’s toes”. The other said “I don’t think so” and abruptly hung up on me. I felt a bit like I was back in that Illinois basement. Silence. asterisk… period. And I don’t think it would have mattered how much I would have paid them. good baseball fans down there. Now we have our tool for speaking out! A foam asterisk. On the phones again. Calls to Chicago, New York, St. Louis. Call after call to retailers that sell products to baseball fans. Call after call. Okay, I guess I understand. I am a business major and I guess I might feel the same as them. But it did bother me; the influence one big industry can have over independent store owners. But that’s okay I guess. I’m a big boy. There’s more than one way to sell a foam Steroid/Asterisk. I figured I’d call a few radio stations and see about some good old fashioned radio publicity! That’s worked for other people right? But living is learning and did you know that most baseball related talk shows are owned or are a part of the ABC/ESPN family? A lot of shows rely on cozy relationships with MLB and as you might expect they were not too eager to have me on the air discussing the topic of the steroid era. But hard work pays off and I managed to find some radio stations that weren’t beholden to the folks at Major League Baseball. Phone interviews with Seattle, Tampa and Mississippi followed. Generally they were smaller stations but nevertheless I was reaching some baseball fans. They were small radio stations but they were independent and I was reaching some baseball fans. And sure enough the Foam Steroid/Asterisk began to sell. Orders came in and we packed them in pizza boxes and sent them off. Still it was hardly the movement I had hoped for and while it wasn’t total silence like in the Illinois basement the impact on the national dialogue was minimal at best. And Hank Aaron’s accomplishments were once again on their way to being hammered as voices were muted. The season was dragging along so my Dodger fan wife and I packed up a hundred asterisks and headed four miles down the road to Dodger Stadium. I should probably tell you that both of us are chickens when it comes to selling stuff but off we went. And we hadn’t sold more than fifty asterisks before the horse backed policemen rode toward us and we ran away. But the fans were into the Foam Steroid/Asterisk! There were kindred souls who felt like we did. There was a demand to be heard. We rushed home and anxiously watched the game on television as the legendary Vin Scully called the game. Certainly he would mention the fans in the stands with asterisks. Alas no… not a word. That’s okay we thought. Maybe he didn’t see them. Maybe we got our hopes up a bit too high. But they were there. Foam Steroid/Asterisks in a Major League Stadium. At least fifty fans unified in spirit and foam. Time passed as we plodded forth with our effort. More phone calls. More emails. We even sent one to every member of congress who was working on the steroid scandal. The season chugged along, the Cubs were constantly losing, and I began to fret… and the phone rang. The New York Post to the Rescue? A quick introduction later the caller asks if I’m going to sell any in NY. He said if I would come to New York when the Giants are at Shea he would do a story. I told him if the Post will do the story I’ll come out and give away a thousand foam Steroid/Asterisks. We agreed. I’d be there. In five days! The levy was about to break. Thank God for my Dodger loving wife who loves baseball because without her, believe me, none of this would have happened. So together we began to put the wheels into motion. We ordered one thousand asterisks to be delivered to the Quality Inn in Queens. We rented a van. We ordered two tickets to New York. My Dodger loving wife has to work so we can pay for all of this, so a good friend of ours offered to come along and help. He’s a Stanford grad… very bright… to bright for this kind of outing I thought… but there he was helping the cause. The writer at the Post called me and read me the story over the phone. It was brilliant. He sent out a photographer to take pictures of me for the article. He said look for the picture and article on page seven. The Asterisk Party was on. In the morning the NY Post was going to tell the fans about a guy who was giving away 1,000 foam Steroid/Asterisks before the game! game, the fans were giving Barry Bonds the “cheat cheat cheat” chant. Not a word of 1,000 free asterisks? No photo? I was stunned. I called the Post writer and woke him. He had not yet seen the paper. Well I can get into the conversation a bit more but that would entail using some pretty foul language so let’s just say I gave him a piece of my fed up Cub fan mind. And soon he discovered the article was not there. In the end he apologized and said he would try to get into the next days paper. “This has never happened to me before”, he said. Now reader, I don’t know how low you have been in your life but I was certainly down on one of the lower rungs of the ladder and the ladder was in a deep hole. I was low. I was down and truth be told I may well have given up right there but for my Stanford friend who didn’t seem to think anything was so earth shattering. I guess we did still have one thousand asterisks in the van. And the van was paid for. And there were fans at the game. Fans who I was sure would gladly take a free asterisk and wave it to honor the traditions of the game. I even thought about selling them but if the Post article were really going to run the next day I thought I should do what I said I was going to do. Give them away. So off we went to Shea. More.